Good night, sleep tight! Create a night-light! I think that question originated from the zombies in Minecraft. (His new favorite game.) My son needs to have his Star Wars Light Saber night-light on before saying good-night. He also has stars that project onto the ceiling. (Something I wish they had when I was little.) I remember having fears at his age, but I had a 10 pound dog that slept with me very single night. Although she was the tiniest dog, I believed Sam would protect me. She had a huge personality! 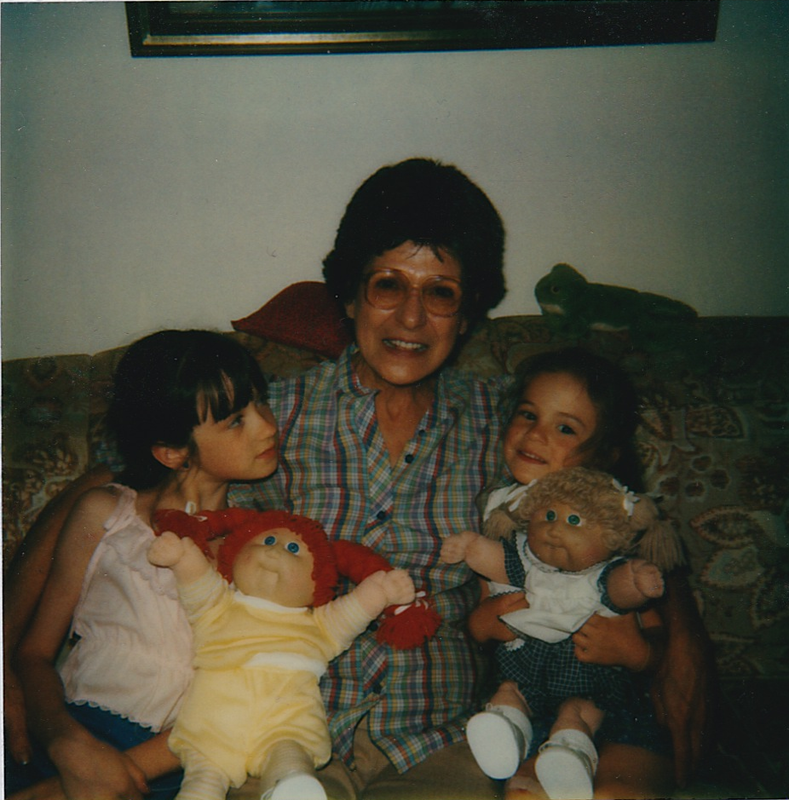 My younger sister, Melissa, also had fears as a child. My mom and dad would put Melissa in my bed after she would go into their room during the middle of the night. They were sneaky! Fears are common at this age, especially with children who are grieving. We addressed this topic in our bereavement support group by creating pillow cases in October. We needed to have another activity on this topic. 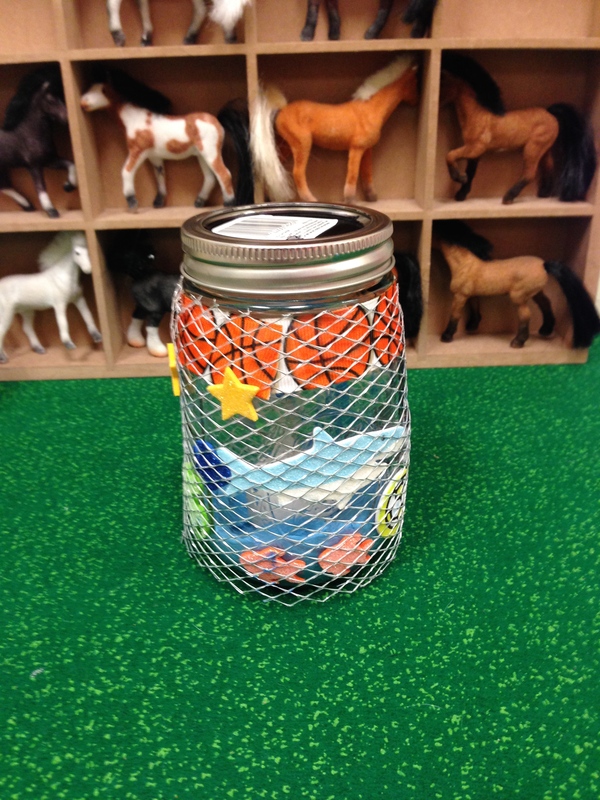 Shari Glaskin, a wonderful facilitator in our group, created a fun activity to cope with this issue. Our group constructed night-lights at our last meeting and it was a huge success! 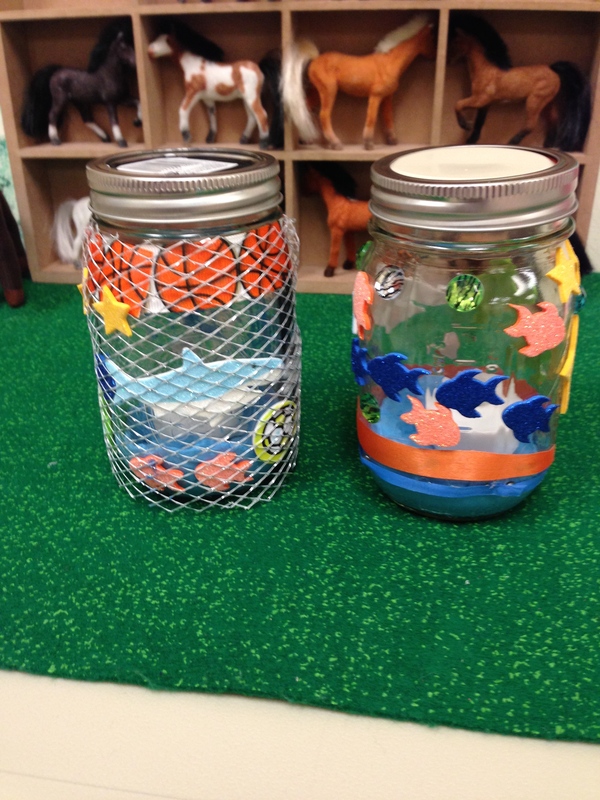 We created the night-lights using mason jars with lids. Try to find jars that have a smooth glass. For the lights, we used battery operated tea lights. 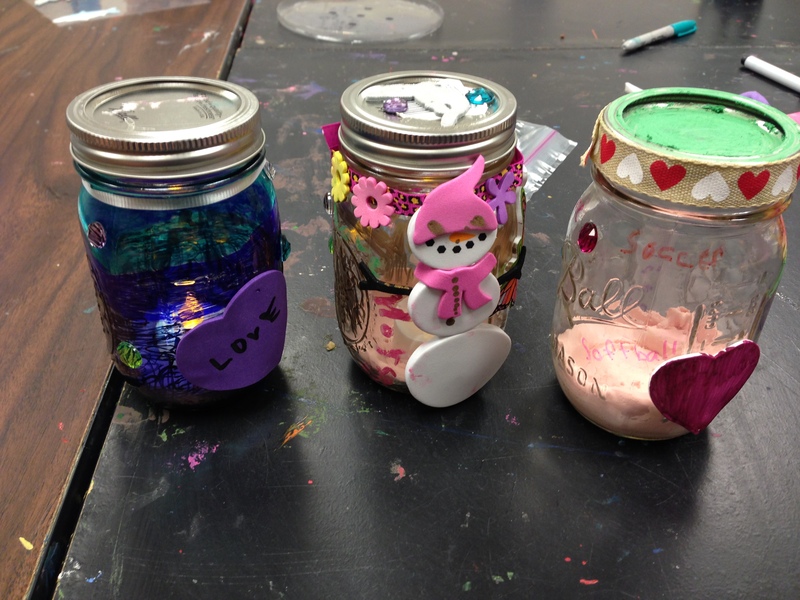 You can find jars and tea lights at a craft store or Target. We also used foam stickers, window markers, and sharpies. In my opinion, the window markers were on the messy side. However, they were washable and rinsed off easily on their hands. The sharpies are permanent, so be careful about getting it on your clothes and hands. 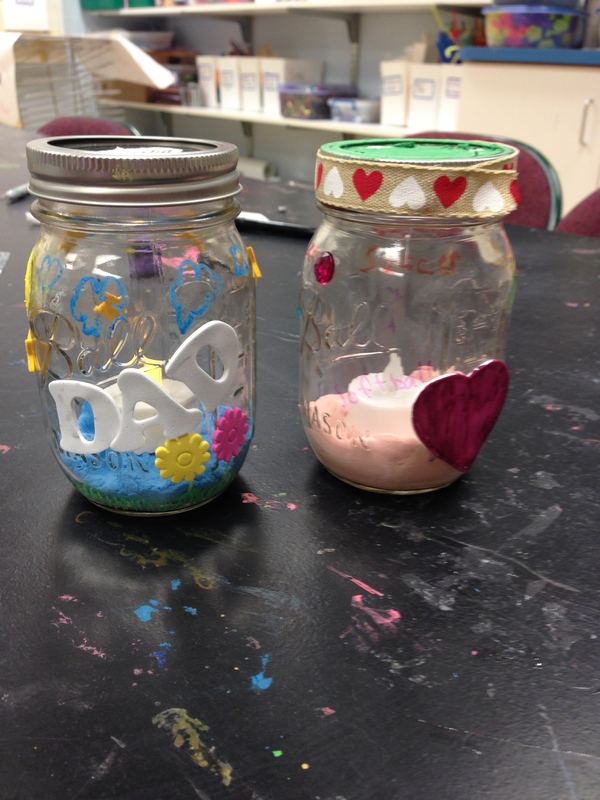 After they decorated the jar, we used a small piece of Crayola modeling clay to create a holder for the tea light. The holder will be placed on the bottom of the jar. We made sure the tea holder fit, took the tea light out, and allowed the clay to dry. Before they left to go home, they placed the tea lights back in their jars. The clay does not take long to dry. The children were so excited about their new night-lights and they were easy to make. This would be a simple project to complete at home. I plan on having my own kids make these on a day off from school. Have fun making your night lights. I promise they will be excited about going to sleep! Please e-mail a picture of your finished night-light. I would LOVE to post them on my website and Facebook page. My e-mail is listed below the pictures. ” If ever there is a tomorrow when we’re not together…..there is something you must always remember. You are braver than you believe, stronger than you seem, and smarter than you think. But the most important thing is, even if we’re apart….I’ll always be with you. 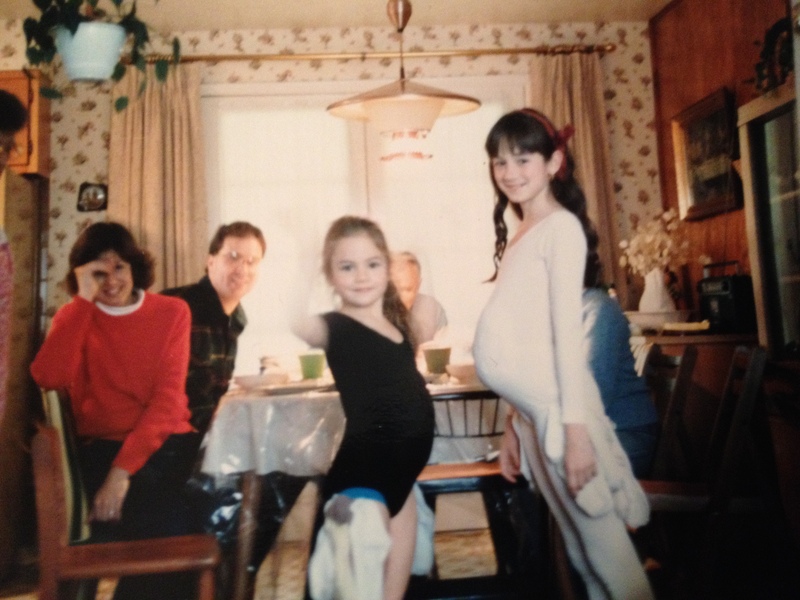 My grandma’s house looked the same during the first Thanksgiving and Christmas without her. The house even smelled as though she lived there. I could still smell the scent of her coffee that she made. My grandfather put out the same tree and decorations, just as she did. However, her absence at the dinner table was the missing piece of the puzzle. Last year I created an activity to use with our grief support group before Thanksgiving. For a few children, it was the first Thanksgiving without their loved one. 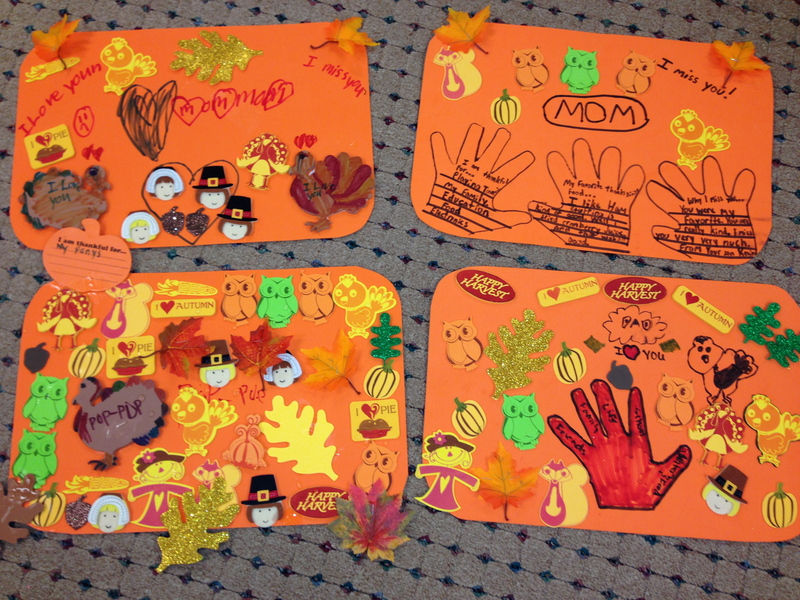 The children made memory placemats to use during Thanksgiving dinner or another special dinner. One child traced his hand three times and wrote things about his mom that he missed. A few children wrote/drew favorite hobbies and characteristics about the loved one. They looked beautiful when they were completed! This is an activity that a child could create for a birthday dinner or the anniversary of the death. A child could make a placemat in honor of a parent that is deployed or hospitalized. We used foam sheets, stickers, and paper leaves for our support group. Use materials available around the house. Your child could browse through magazines and cut out pictures to glue. Scissors that make the curvy edges could add a special touch. Before you eat dinner with your special memory placemat, everyone at the table could say a favorite memory of the loved one.